This article is about the Texas-based hamburger chain restaurant. For the Virginia-based hamburger chain restaurant, see What-A-Burger. Whataburger is an American privately held regional fast food restaurant chain, headquartered and based in San Antonio, Texas, that specializes in hamburgers. The company, founded by Harmon Dobson and Paul Burton, opened its first restaurant in Corpus Christi, Texas, in 1950. The chain is owned and operated by the Dobson family, along with 25 franchisees as of April 2012[update]. As of April 2017[update], there are 824 Whataburger stores across the Southeastern and Southwestern United States regions. Whataburger was known for many years for its distinct A-framed orange-and-white-stripe-roofed buildings. The first A-frame restaurant was built in Odessa, Texas, and is now a historical landmark. The company's core products includes the "Whataburger", the "Whataburger Jr.", the "Justaburger", the "Whatacatch" (fish sandwich), and the "Whatachick'n". The company also has a breakfast menu. In 1950, Harmon Dobson and Paul Burton were looking to open a hamburger restaurant. Dobson's goal was to "make a better burger that took two hands to hold and tasted so good that when you took a bite you would say 'What a burger!'" In June 1950, Dobson was granted the Whataburger trademark. In August of that year they opened their first location on Ayers Street in Corpus Christi, Texas, across from Del Mar College. The store sold burgers for 25 cents, and also sold drinks and chips. In 1951, Burton and Dobson ended their partnership after arguments concerning Dobson's price raise of the burger from 25 to 30 cents. Burton settled with owning the Whataburger franchises in San Antonio, Texas. Months later, prices for burgers were raised to 35 cents. In 1952, Dobson opened a location in Kingsville, Texas, the first store outside of Corpus Christi. In 1953, Joe Andrews, Sr. became the first non-founder franchise owner with a location in Alice, Texas. In 1959, the first Whataburger restaurant outside Texas opened in Pensacola, Florida. By 1960, there were stores operating across Texas, Florida, and Tennessee. Inspired by his love for flying, Dobson designed the orange and white striped A-frame store in Odessa, Texas, in 1961. In 1962, the company added French fries and hot pies to its menu. In 1963, it expanded to Arizona and totaled 26 stores. In 1965, it estimated selling 15,000 burgers daily in the Texas Coastal Bend area. In 1967, the company commissioned the "Flying W" company logo, and the company had expanded to 40 restaurants in four states. On April 11, 1967, Dobson and an associate died in an airplane crash and Dobson's widow Grace took control of the business. In 1969, Grace became chairman of the board. In 1971, the company opened its first drive-through store, and in 1972, it opened its 100th store. In 1974, the A-frame design was changed to a "Modern A-Frame" to accommodate drive-thrus and larger dining rooms. In 1980, the company opened its 300th store. In 1982, three Corpus Christi stores began 24/7 service. In 1983, the company added Breakfast on a Bun, the Whatachick'n sandwich and breakfast taquitos to its menu. In 1987, it opened its 400th store, and also shut down operations in California. This Whataburger in Frisco, Texas, opened in 2008. In 1993, Harmon and Grace Dobson's son, Tom, became the CEO and President. The menu expanded, offering Whatameal packages, cookies and biscuits, and chicken strips. The company celebrated its 500th store opening in 1995, and was noted as the country's eighth-largest hamburger chain. On May 6, 1999, the company opened "Whataburger by the Bay" on Shoreline Drive in Corpus Christi. It is the largest Whataburger store at 6,000 square feet (560 m2). The site includes a life-size bronze statue of Harmon Dobson. On August 8, 2000, Whataburger celebrated its 50th anniversary with 575 operating stores. In 2001, during the 77th Texas Legislative Session, a bill was passed proclaiming Whataburger to be a Texas Treasure. In 2003, it hired Austin-based advertising firm McGarrah Jessee, which created an advertising campaign featuring the gravelly voice of Ohio actor William Bassett. In 2007, the company achieved 700 stores in ten states with annual revenue of $1 billion. In October 2011, the company changed its television ads from Bassett's voiceovers to "documentary-style ads employees and customers using their own words to describe what makes Whataburger special." By the end of the year, it had 728 stores operating in ten states. The Dobson family owns 611 stores, and the other "117 are owned and operated by about 25 franchisees." On August 8, 2015, Whataburger celebrated its 65th anniversary by offering free upgrades on Whatameals. Due to the success of selling Whataburger sauces at H-E-B since 2014, the company announced it will offer 1-pound packages of bacon at H-E-B and Central Market stores. Whataburger sells its line of condiments in 14oz and 20oz squeeze bottles. These include ketchup, spicy ketchup, mustard, honey mustard sauce, honey BBQ sauce, the signature honey butter, and others. It also sells jars of its picante sauce and salsa verde, as well as boxed pancake mix. These are available at H-E-B stores as well as other retailers. In 2009 the company moved from its long time base in Corpus Christi to a new headquarters at 300 Concord Plaza Drive, a 140,000-square-foot (13,000 m2) building in San Antonio. The company has field offices in Irving in Dallas-Fort Worth. Previously the corporate headquarters were in Corpus Christi and the chain had regional offices in Corpus Christi, Houston, Irving, and Phoenix, Arizona. Whataburger is sometimes confused with the What-A-Burger (hyphenated) chain of family-operated restaurants in Virginia, North Carolina, and South Carolina. The first What-A-Burger store opened in 1950 by entrepreneur Jack Branch near Newport News, Virginia, at Newport News Circle (intersection of Jefferson Avenue and U.S. Route 258) in the former Warwick County. Branch's first location preceded the first Texas Whataburger restaurant slightly; the move took place after a modernization project involving the traffic circle. What-A-Burger and Whataburger were unaware of each other's existence several states apart until around 1970, when there was some correspondence. However, no legal actions took place until 2002–2003, when both companies sued each other over the alleged trademark infringement. The Court of Appeals, in 2004, eventually decided the Texas Whataburger had a legitimate trademark; but the Virginia chain did not harm the much larger Texas-based chain in any way or any reasonable public confusion: "There is no evidence — nor can we imagine any — that consumers are currently likely to be confused about whether the burgers served by Virginia W-A-B come from Texas or Virginia." A second restaurant chain based in North Carolina, named What-A-Burger Drive-In, owned by Eb and Michael Bost, was not a party to the lawsuit, but under case law procedures, it would also retain its name. It visibly numbered their stores starting from #1 in Kannapolis, North Carolina, to #15 in Concord, North Carolina, six of which remain in operation as of March 2009[update]. Whataburger has sponsored a variety of music festivals. The company has also sponsored sports through the Whataburger Sports Complex in Kilgore, Texas, the Arizona Soccer Association, and David Starr Racing, among others. ^ a b c d e f g h i Jones, Cindy. "Whataburger". Handbook of Texas Online. Texas State Historical Association. Retrieved September 12, 2012. ^ a b c d e f g h "Whataburger Store Locations Map". Whataburger. Retrieved April 4, 2018. ^ a b c d Hendricks, David (April 11, 2012). "Whataburger sales and stores are growing". MySanAntonio.com. San Antonio Express News. Retrieved September 12, 2012. ^ a b "First Whataburger "A" Frame Design, Odessa TX". Waymark. Groundspeak, Inc. Retrieved May 24, 2012. ^ "Gone But Not Forgotten in San Antonio". city-data.com forums. October 3, 2007. ^ a b c d e f g h i "Our Story". Whataburger. Retrieved September 12, 2012. ^ "Top 9 Now-Defunct L.A. Fast Food Restaurant Chains + The Return of #3". L.A. Weekly. Retrieved January 4, 2016. ^ "Whataburger by the Bay set to open Thursday". Corpus Christi Online. Corpus Christi Caller Times. May 4, 1999. Retrieved September 12, 2012. ^ QSR Magazine. Whataburger Declared a Texas Treasure. April 6, 2001. Retrieved 2015-08-01. ^ "McGarrah/Jessee lands a whopper: Whataburger". Austin Business Journal. May 2, 2003. Retrieved September 12, 2012. ^ a b Pack, William (October 6, 2011). "Whataburger ads: Buh-bye Texas voice, hello documentaries". MySanAntonio.com. San Antonio Express-News. Retrieved September 12, 2012. ^ "Happy birthday, Whataburger! Beloved chain offers freebies on Saturday". August 7, 2015. Retrieved August 7, 2015. ^ "Whataburger's Hickory Smoked Bacon now sold at H-E-B stores". May 29, 2018. Retrieved May 31, 2018. ^ "Whataburger at H-E-B". HEB. Retrieved January 11, 2019. ^ a b c d "Whataburger buys San Antonio office building for new headquarters". San Antonio Business Journal. March 30, 2009. p. 1. ^ Creighton A. Welch (November 22, 2008). "Whataburger to move headquarters to San Antonio". San Antonio Express-News. ^ "Drop Us A Line" (Archive) Whataburger. Retrieved on March 16, 2014. "Home Office 300 Concord Plaza Dr. San Antonio, TX 78216" and "Field Offices San Antonio 1077 Central Pkwy South Suite 900 San Antonio, TX 78232[...]Irving 4040 West Royal Lane Suite 126 Irving, TX 75063"
^ "Corporate Information" (Archive) Whataburger. December 1, 2002. Retrieved on March 16, 2014. "Whataburger Corporate Office One Whataburger Way Corpus Christi, TX 78411" and "Whataburger Regional Office Corpus Christi, Rio Grande Valley, Victoria, San Antonio 4140 S. Staples Corpus Christi, TX 78411" and "Houston/Galveston 1900 N. Loop W Houston, TX 77018 Ste. 400" and "Dallas/Fort Worth, Central Texas, Austin 1600 Corporate Court Irving, TX 75038 Ste. 100" and "Phoenix, Tucson, Kingman, Prescott 3150 S 48th St. Phoenix, AZ 85040 Ste 160"
^ Vaughan, Vicki (November 26, 2009). "Whataburger adjusting to economy". Houston Chronicle. Retrieved September 12, 2012. ^ Welch, Creighton A. (November 22, 2008). "Whataburger to move headquarters to San Antonio". Houston Chronicle. San Antonio Express-News. Retrieved September 12, 2012. ^ a b "Whataburger buys San Antonio office building for new headquarters". San Antonio Business Journal. March 30, 2009. p. 2. ^ "What-a-Burger of Virginia v. Whataburger Inc". leagle.com. April 3, 2003. ^ What-A-Burger v. Whataburger , 357 F.3d 441 (United States Court of Appeals, Fourth Circuit. 2004). ^ Seltzer, Debra Jane. "North Carolina drive-ins". RoadsideArchitecture.com. Retrieved September 12, 2012. ^ Mason, Sharon (March – April 2009). "What-A-Place" (PDF). Cabarrus Living. pp. 22–23. ^ "SponsorPitch - Whataburger". SponsorPitch. Retrieved June 11, 2018. ^ "Sports complex secures Whataburger as sponsor". Kilgore News Herald. March 9, 2018. Retrieved June 11, 2018. ^ "Sponsorship of AYSA". Arizona Soccer Association. Retrieved June 11, 2018. ^ "David Starr Partners with Whataburger at Texas Motor Speedway". David Starr Racing. March 31, 2014. Retrieved June 11, 2018. 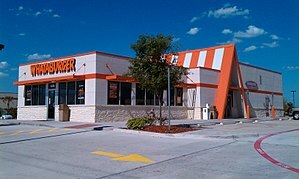 Wikimedia Commons has media related to Whataburger.